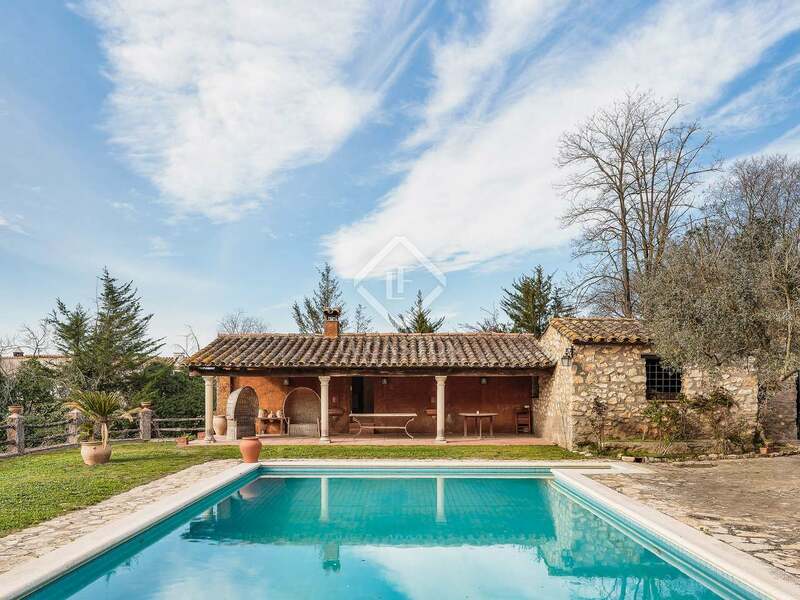 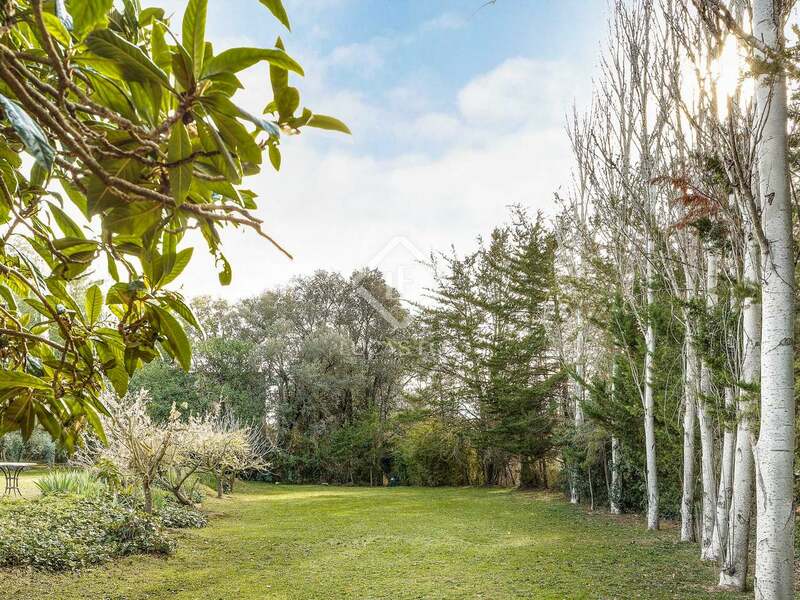 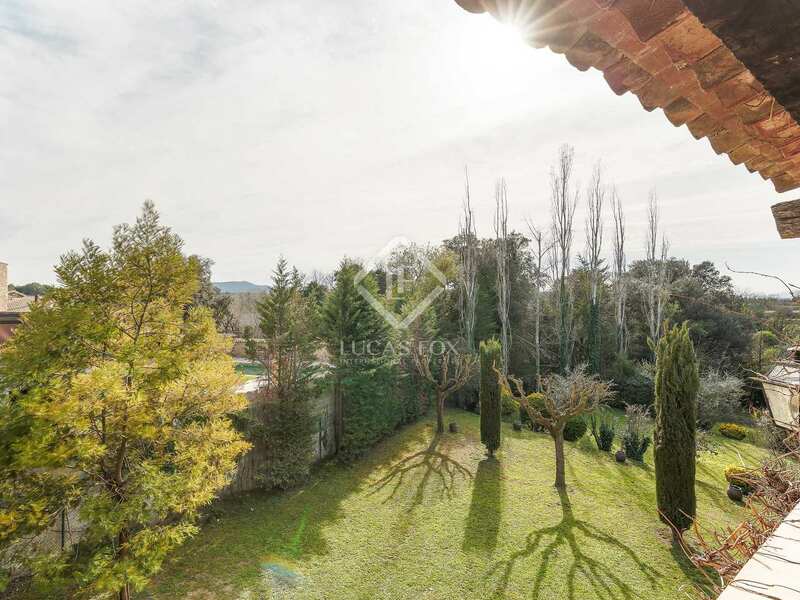 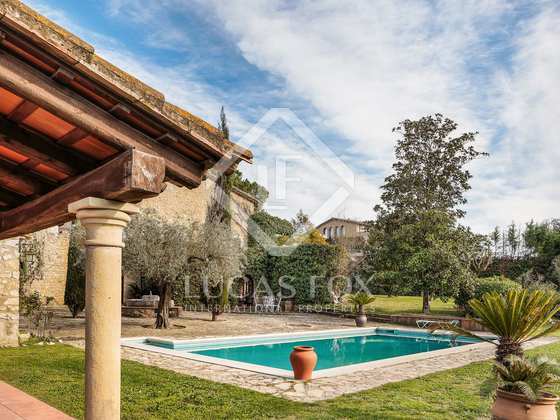 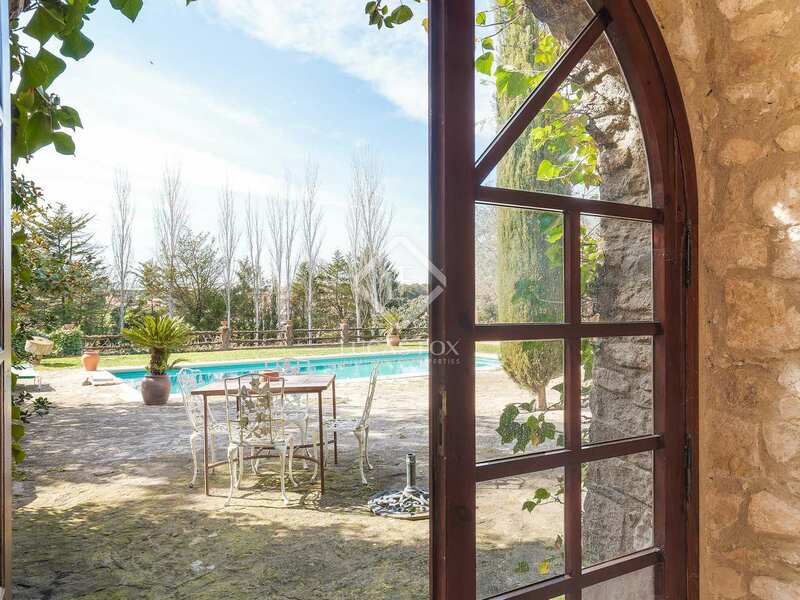 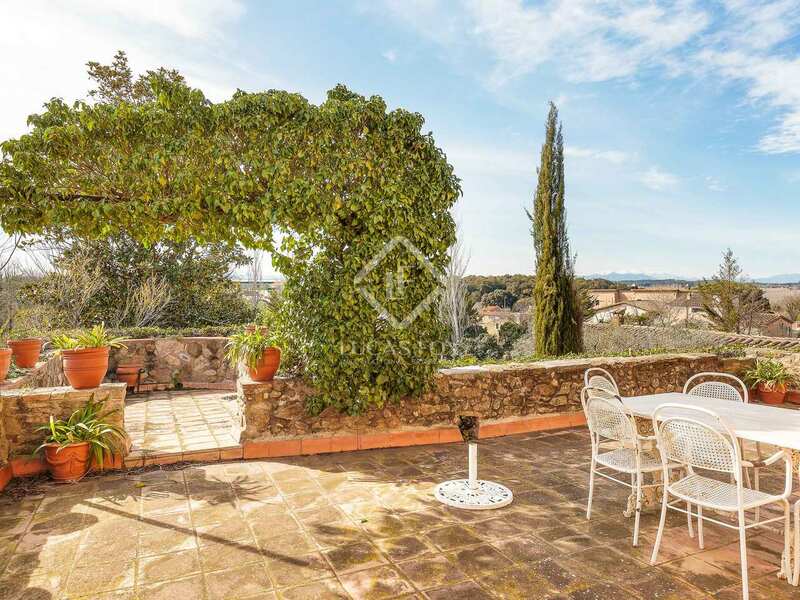 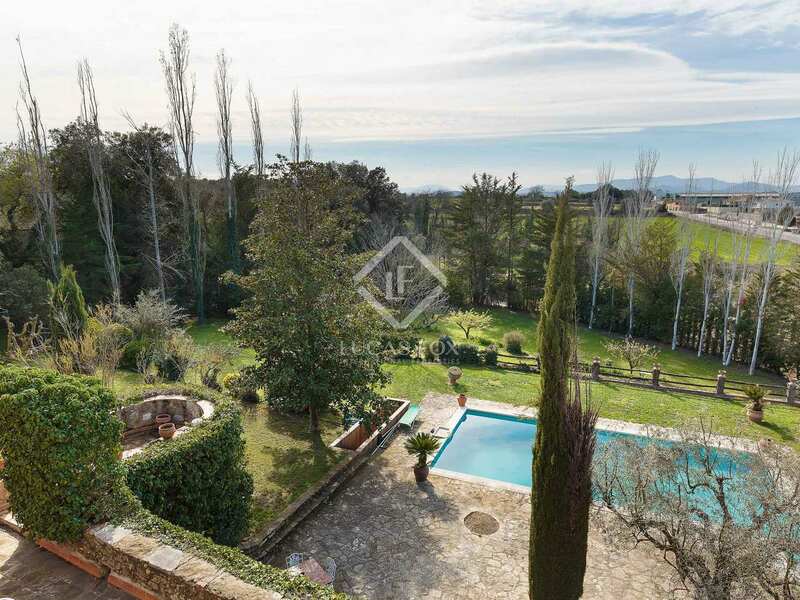 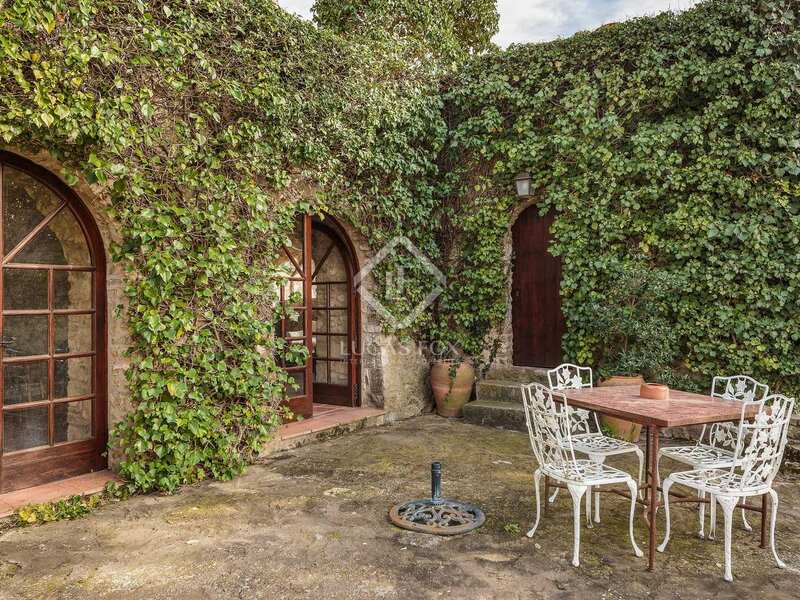 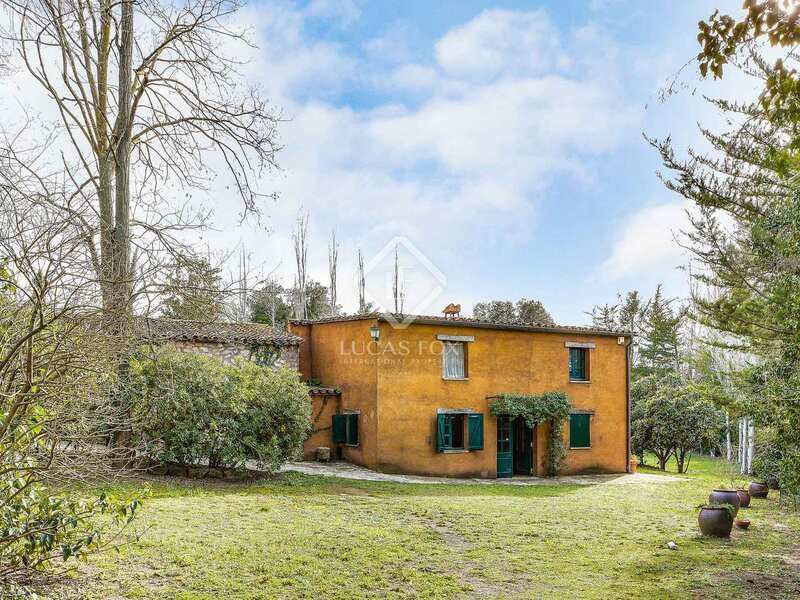 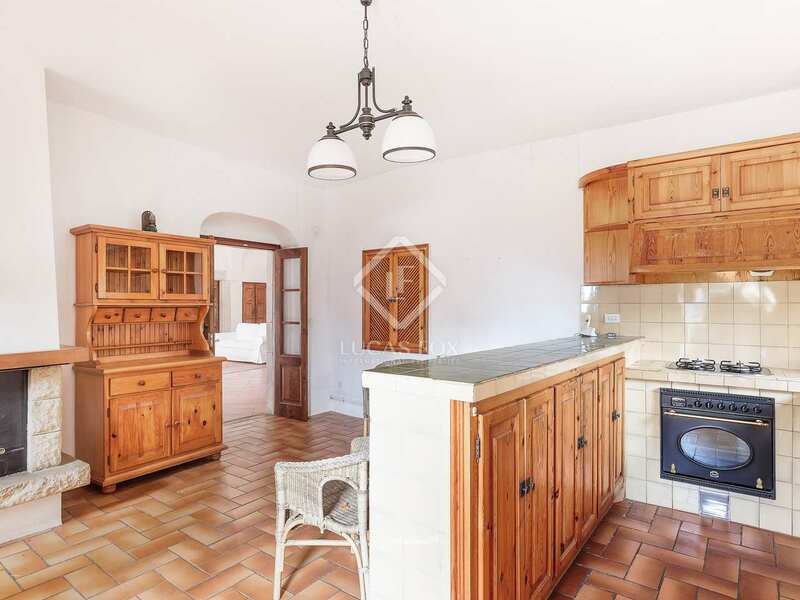 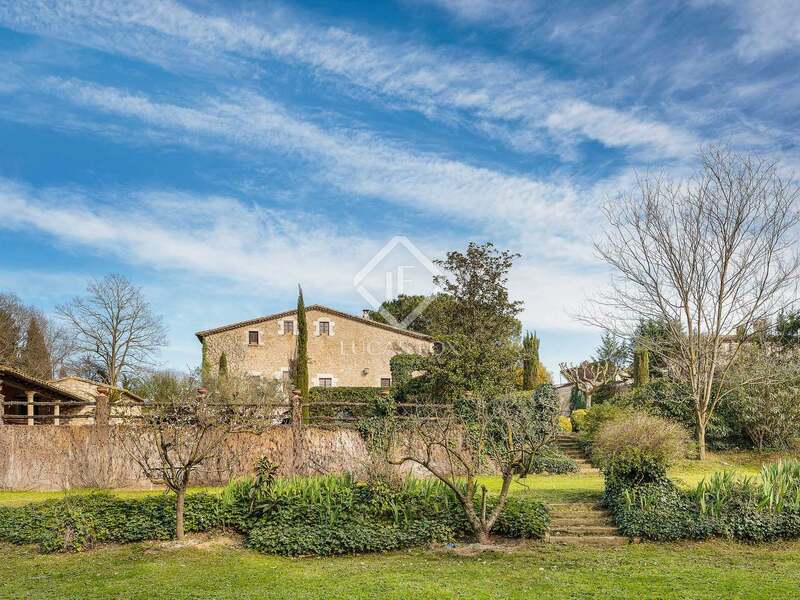 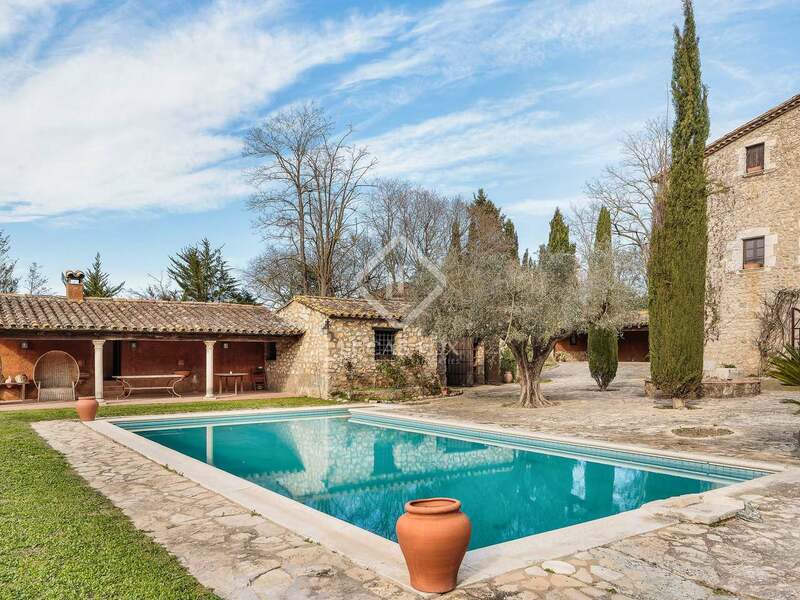 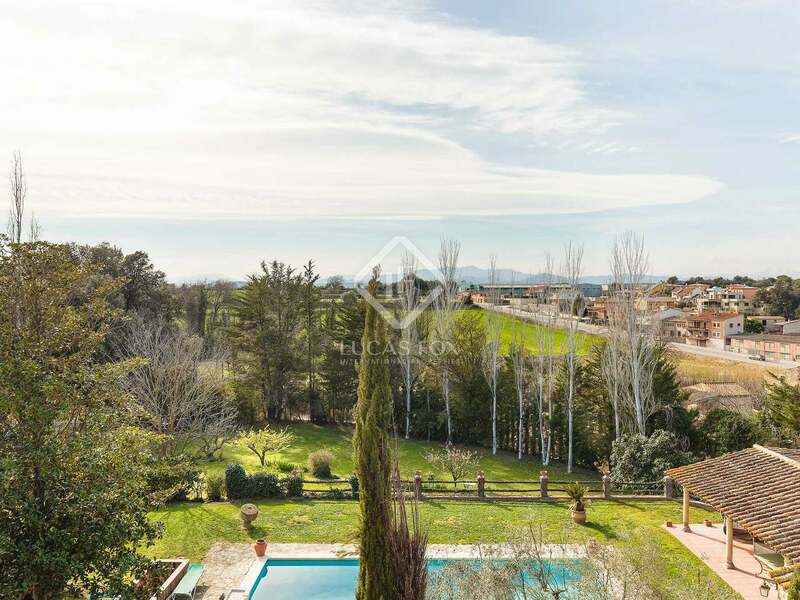 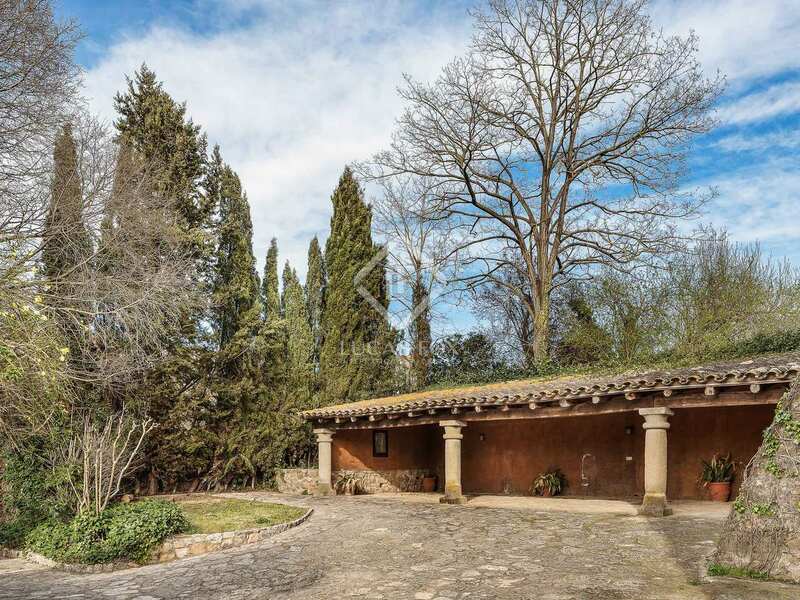 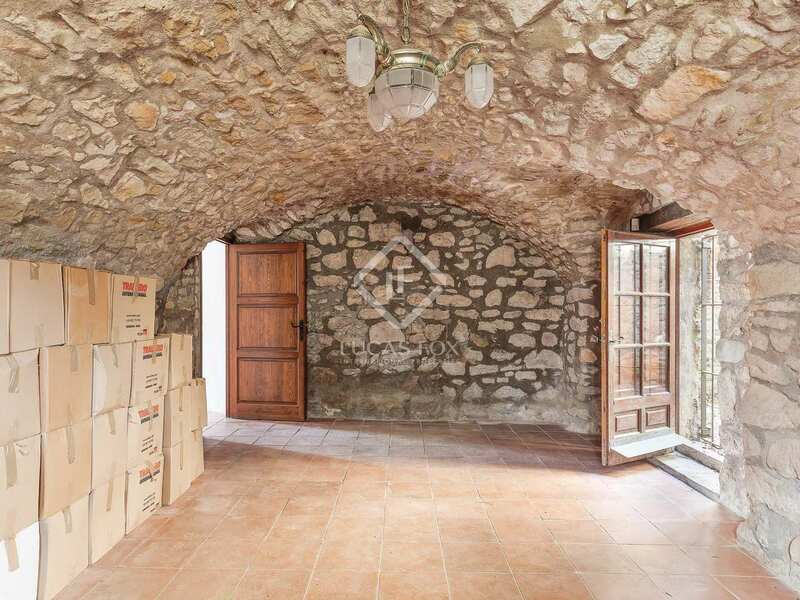 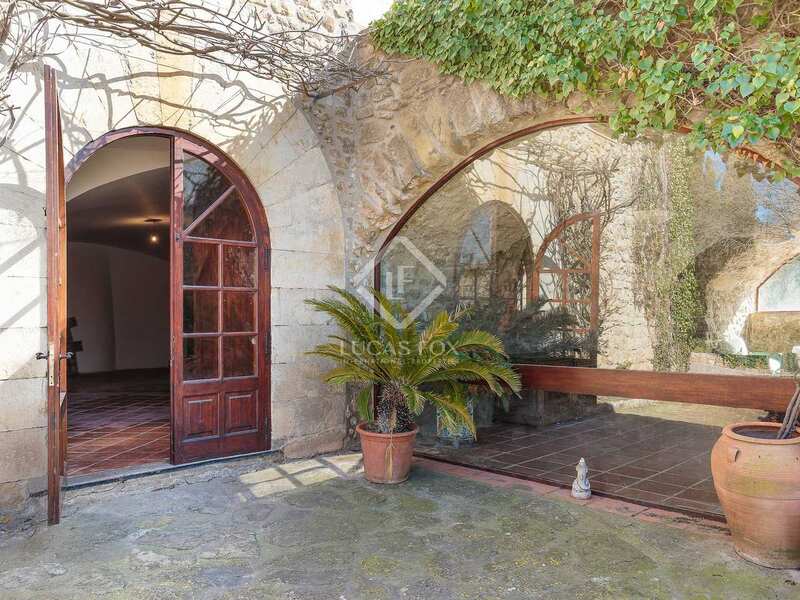 Large country house with separate guest house and 5,217 m² walled garden, on the edge of a small village near Girona City. 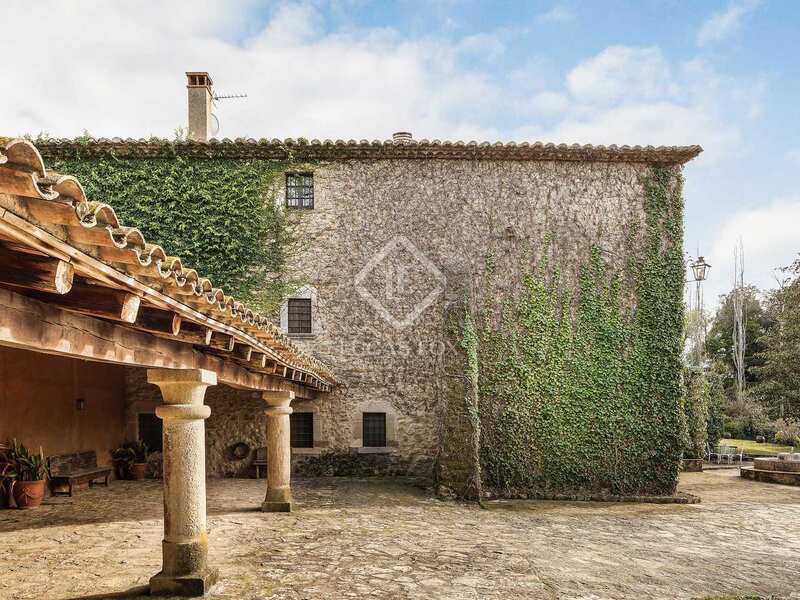 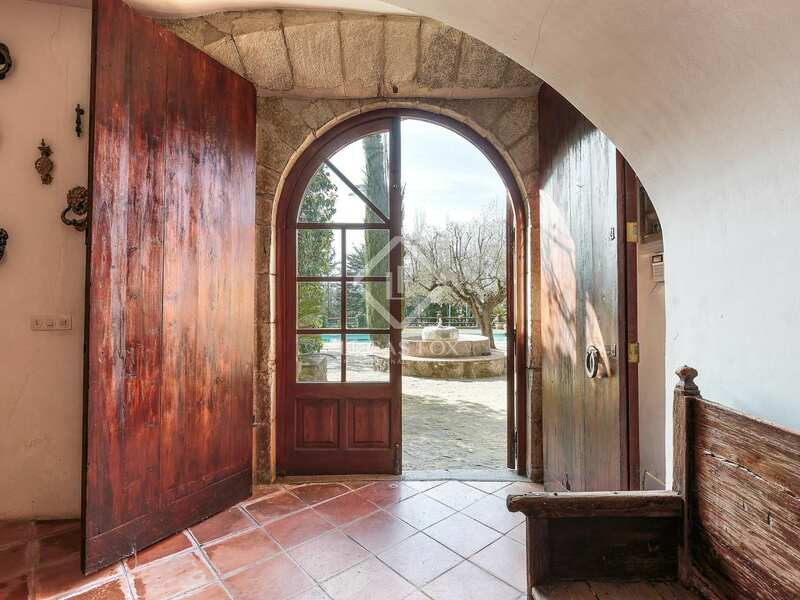 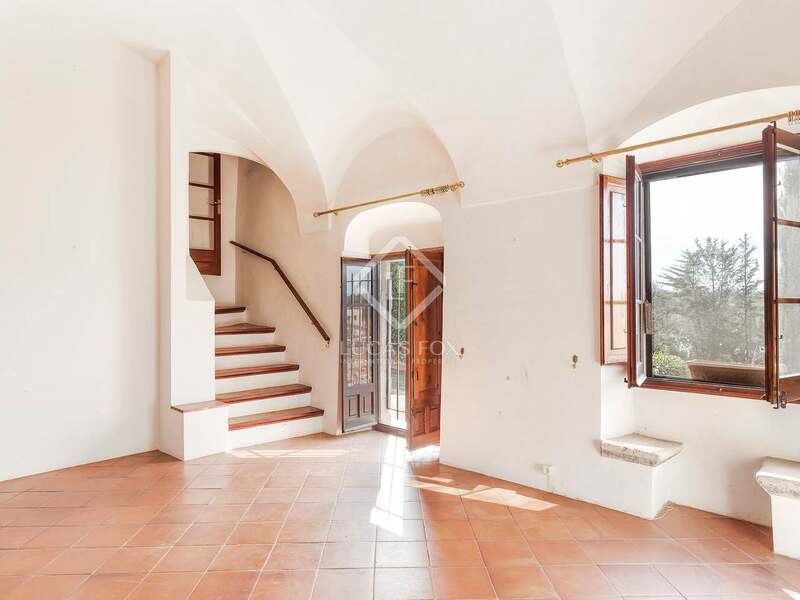 In a small village 20 km from Girona and 25 km from the beaches of the Costa Brava, we find this magnificent 18th century country estate for sale, with a built area of 1,070 m². 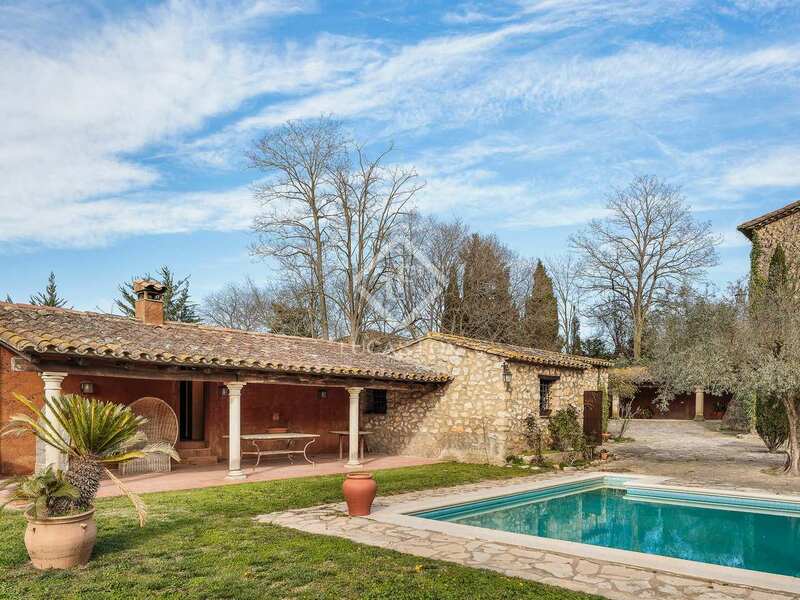 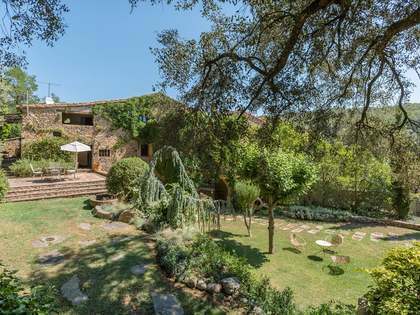 Set on the 5,217 m² plot is the wonderful main masia, a separate guest house and a beautiful private walled garden with an 11 x 6 metre pool, a large porch, barbecue, fruit trees and parking for 4 cars; all with pleasant views over the countryside, the village and mountains beyond. 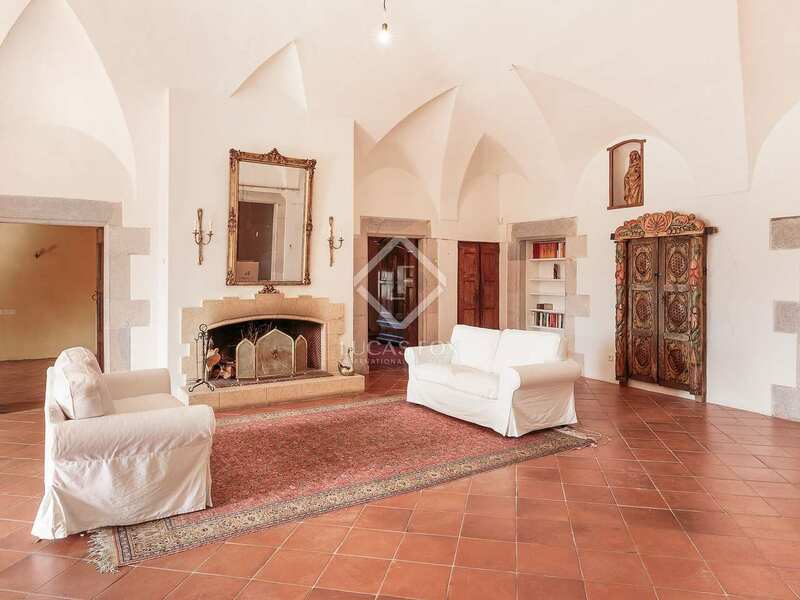 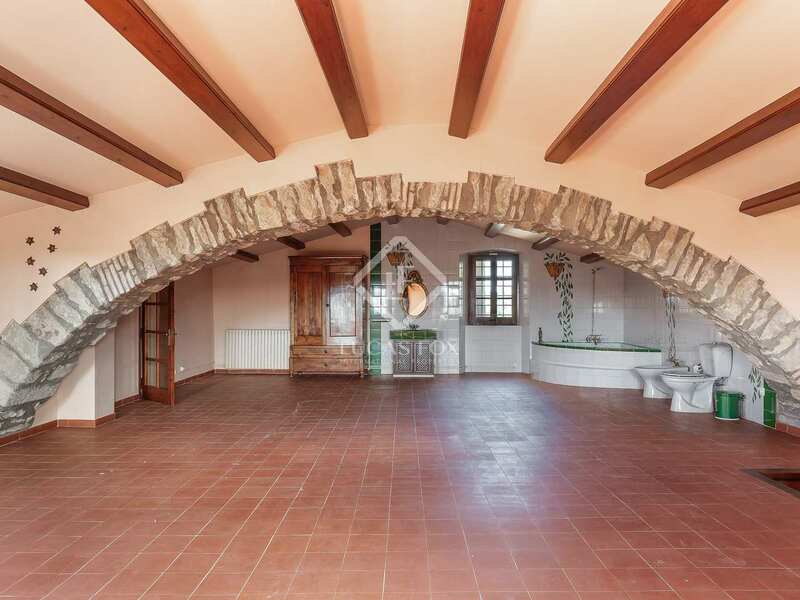 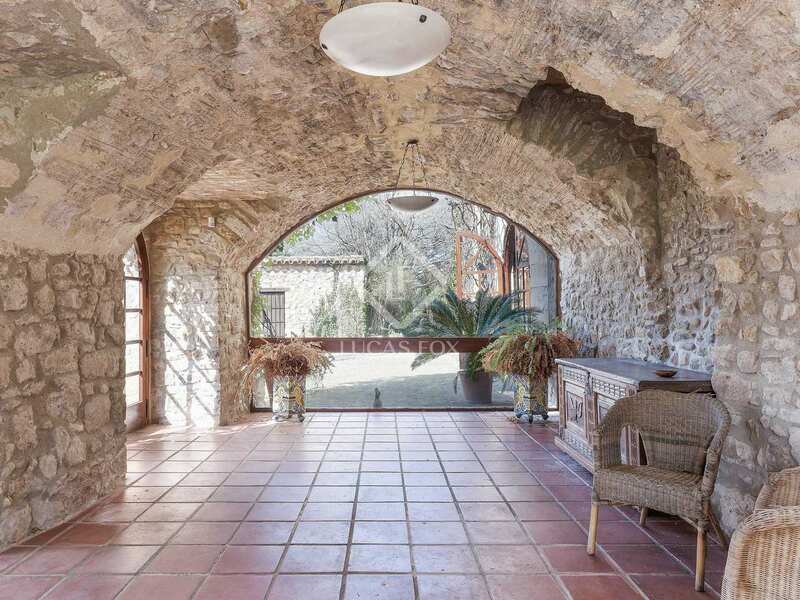 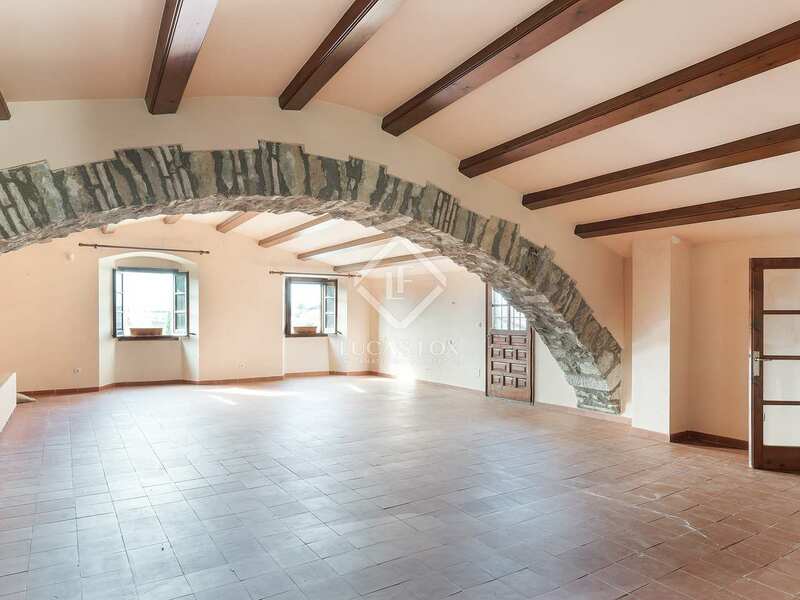 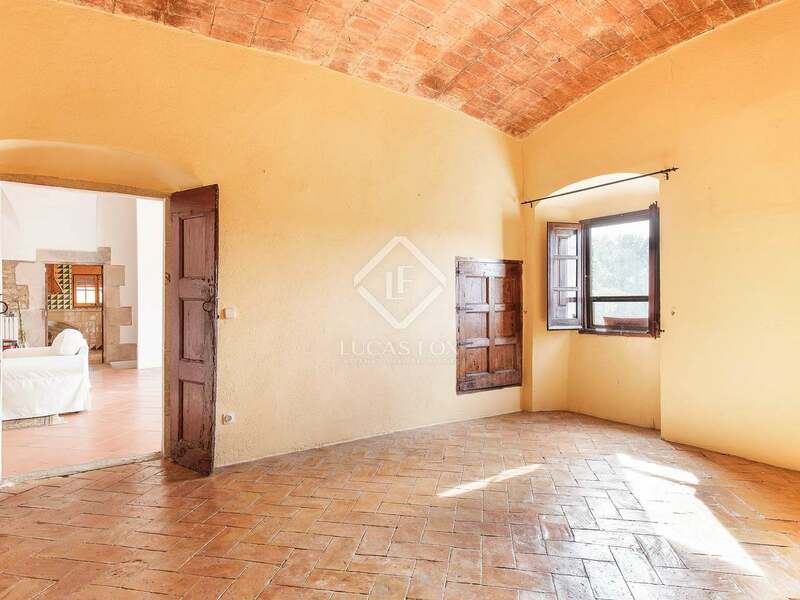 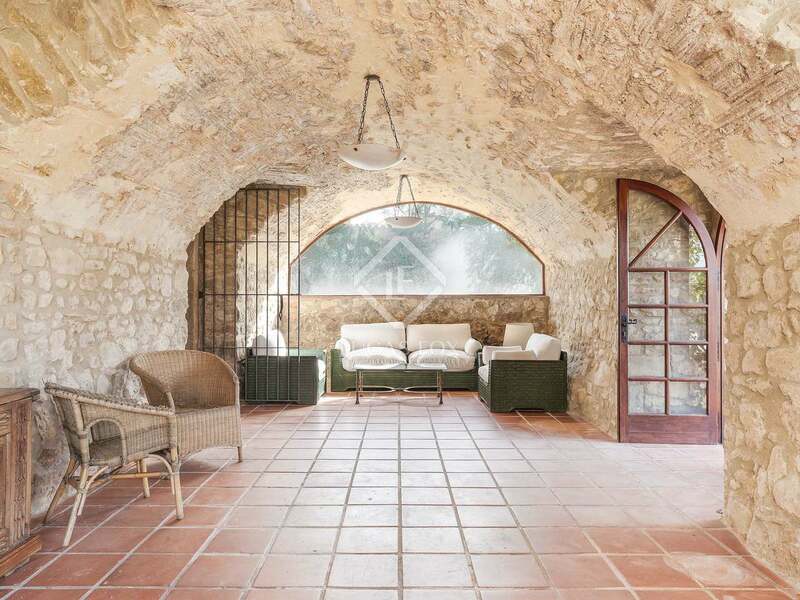 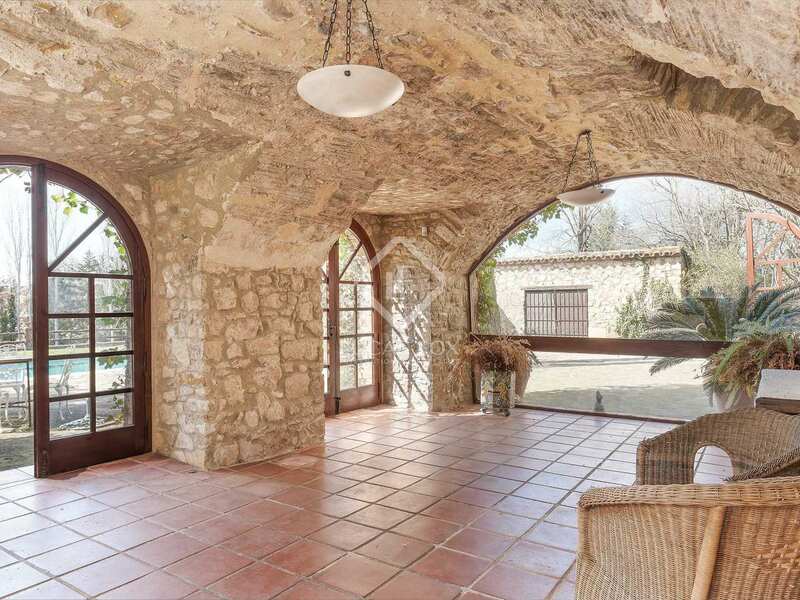 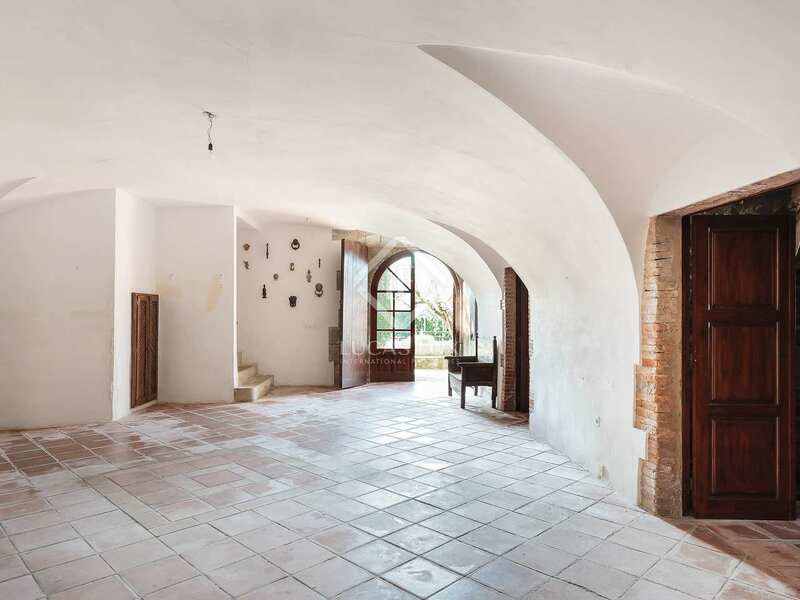 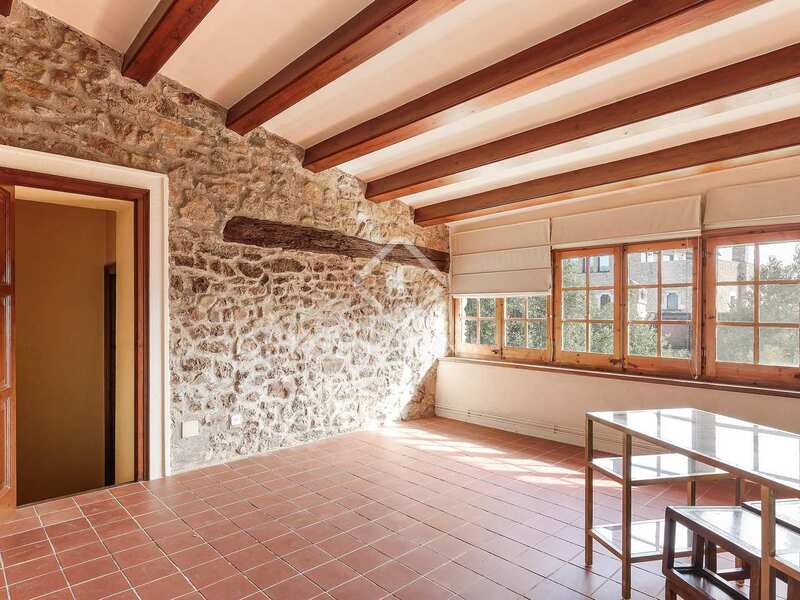 The main house has the original structures, with impressive vaulted ceilings on the ground floor, thick stone walls and stone lintels in the main living area. 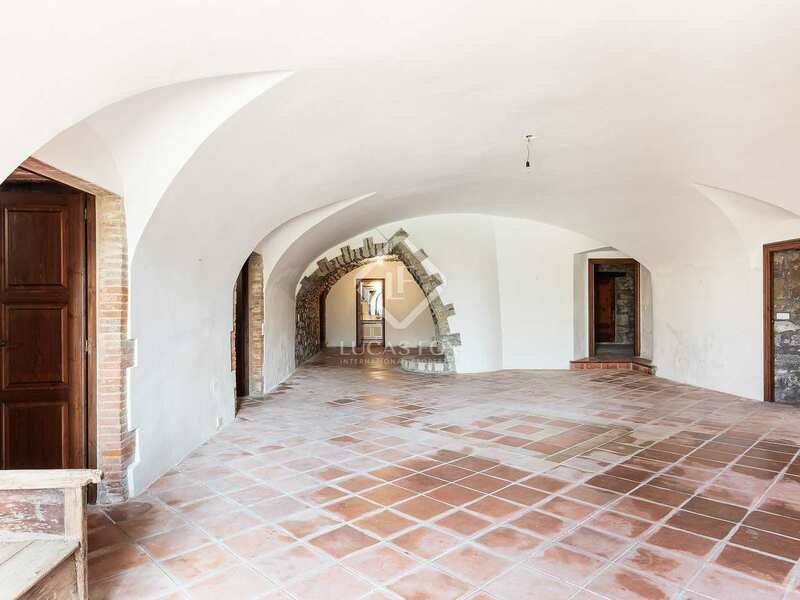 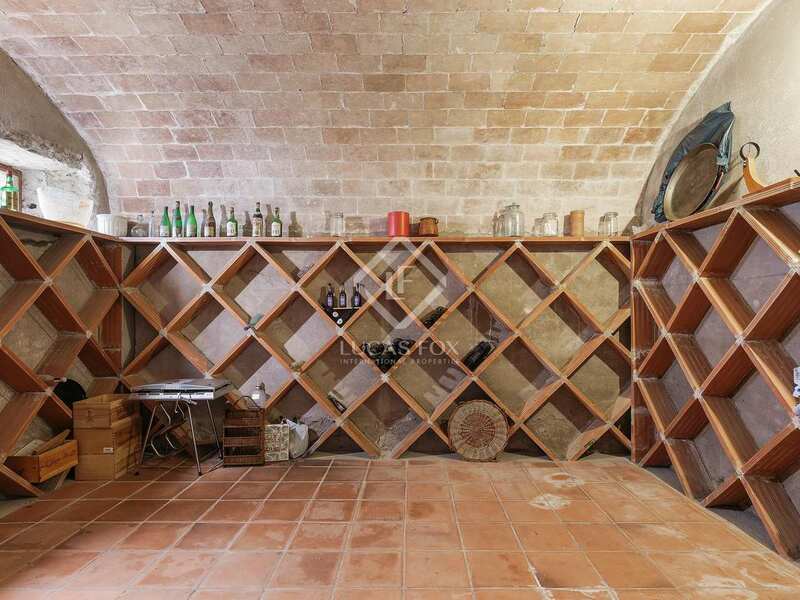 The ground floor opens up to reveal a large vaulted entrance hall, 2 bedrooms, a bathroom, a summer sitting room room with access to the garden, 2 extra rooms currently used as a study and a tv room and a wine cellar (bodega). 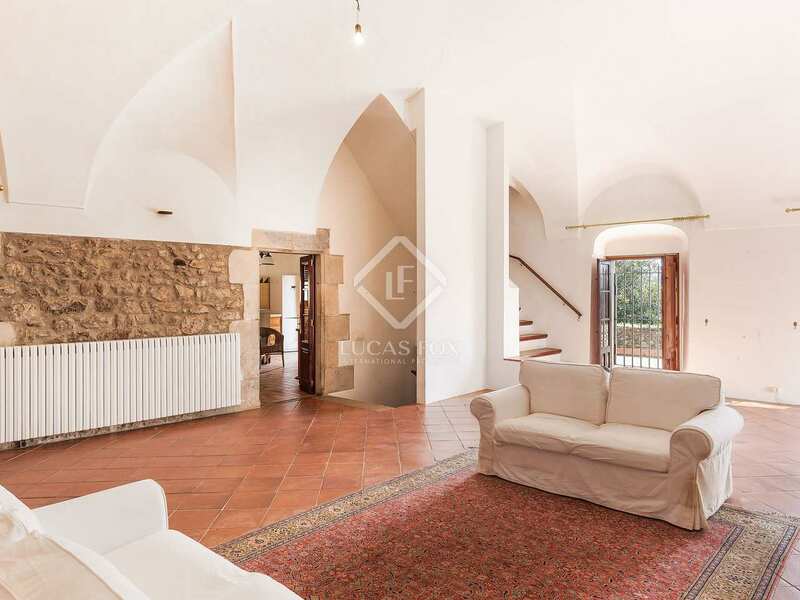 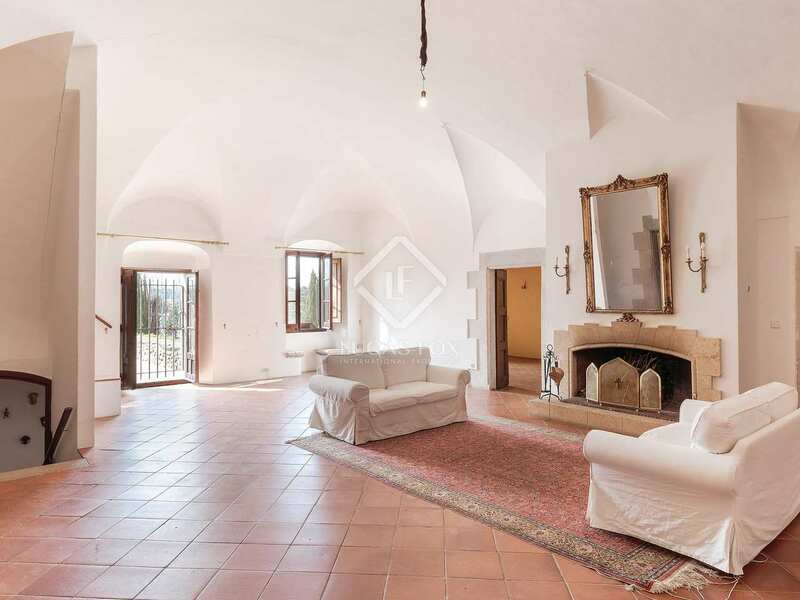 The first floor boasts an impressive main living room with vaulted ceilings, a fireplace and access to a large terrace. 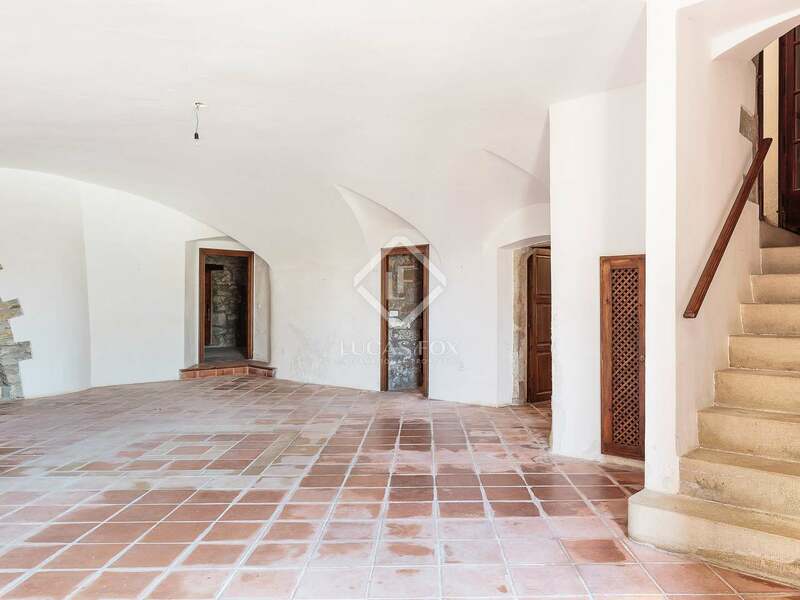 There is a separate kitchen/dining room also with access to the terrace for outdoor dining, 2 large bedrooms and 2 bathrooms plus a laundry and ironing room. 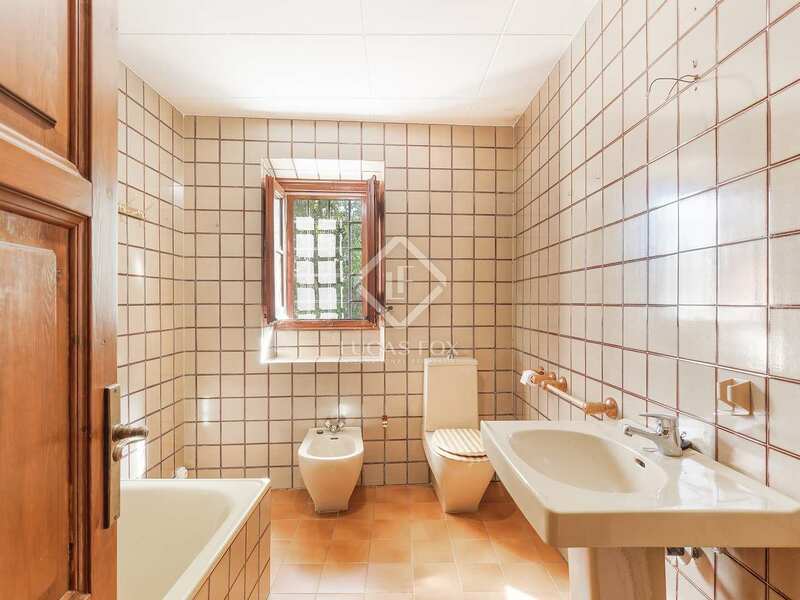 On the second floor there are 2 separate areas, each with independent access. 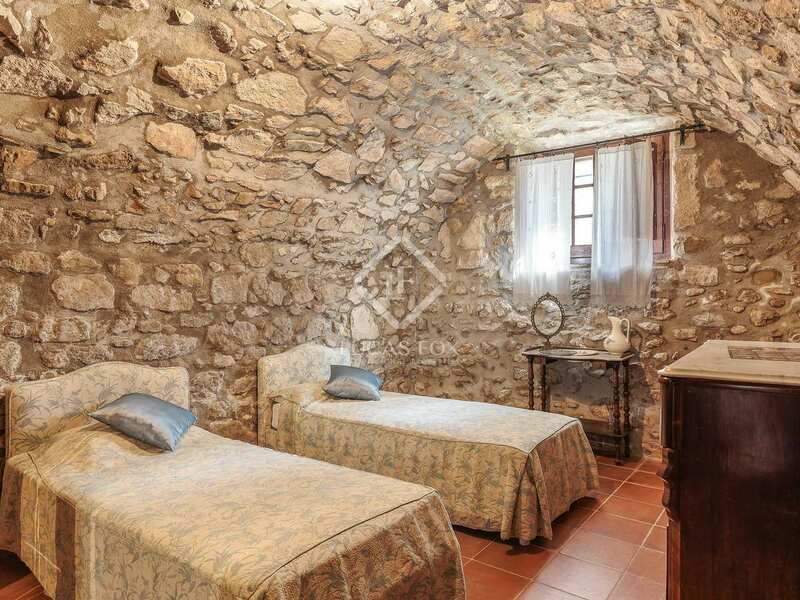 Zone A has a room with 2 single beds and a library with Wi-Fi. 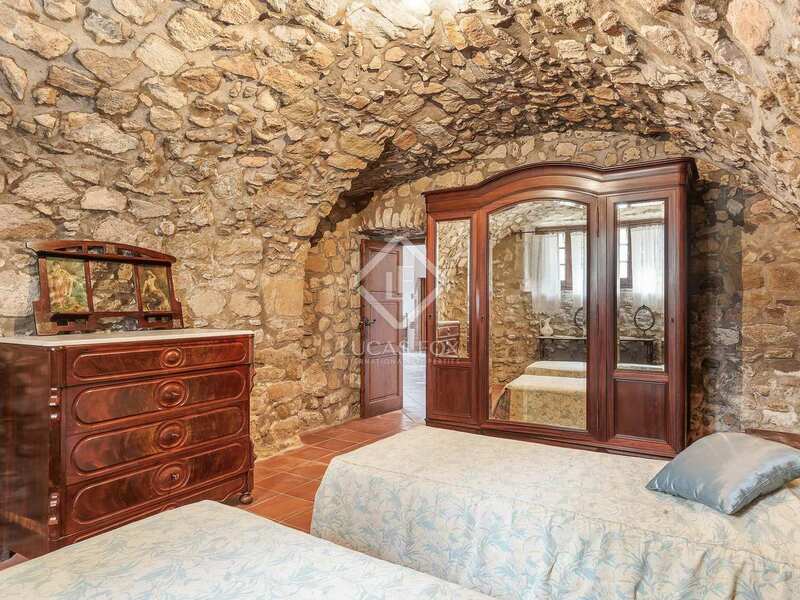 Zone B offers a huge vaulted room with a double bed and a bathroom. 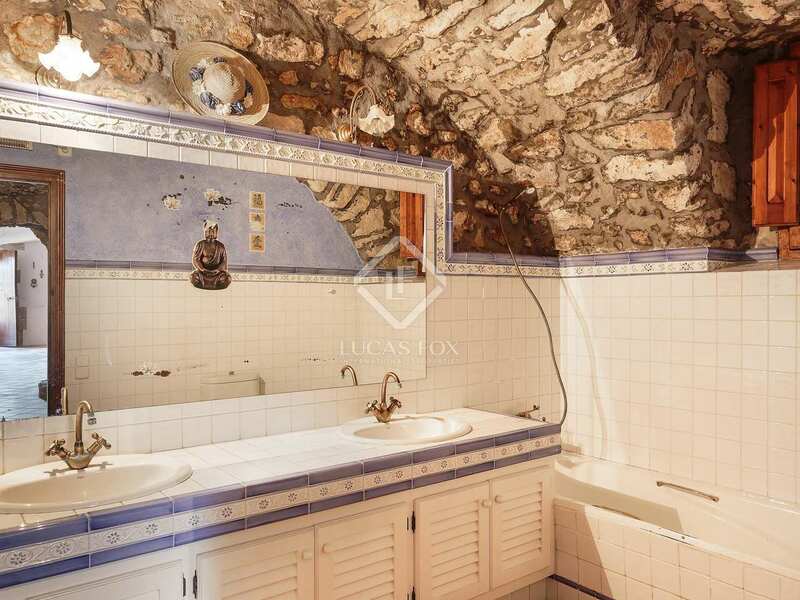 This room provides access to a room with 2 single beds and a terrace. 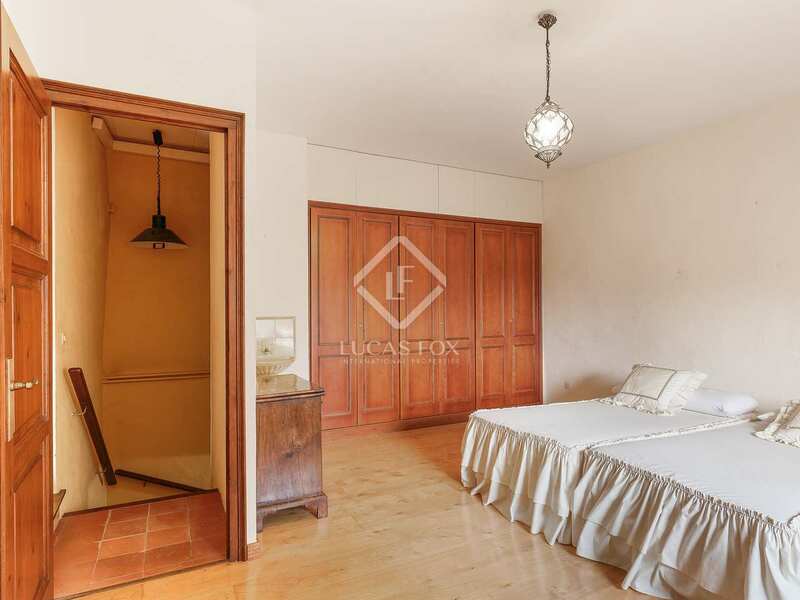 The separate guesthouse consists of 3 double rooms, 2 bathrooms and a large kitchen / dining room / living room. 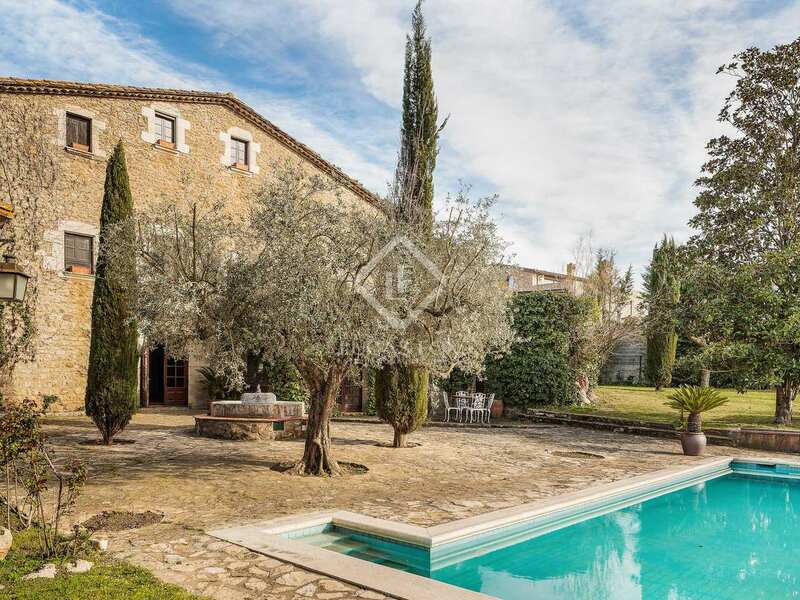 Given the location, size and historic and architectural characteristics of this property, it would be ideal for a large family to live in permanently or use as a luxury holiday home. 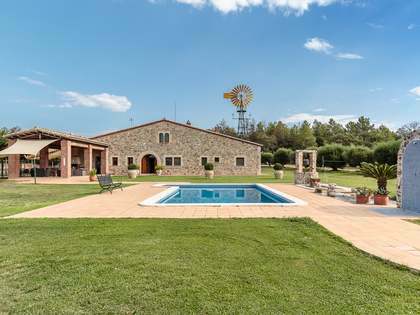 It would be equally suitable for use as a boutique rural hotel. 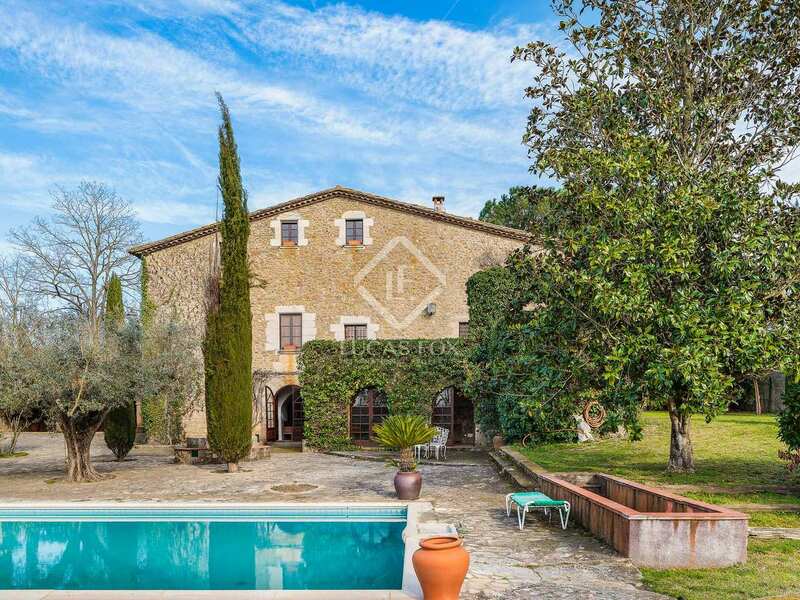 Contact Lucas Fox for further details of this wonderful property or to arrange a visit. 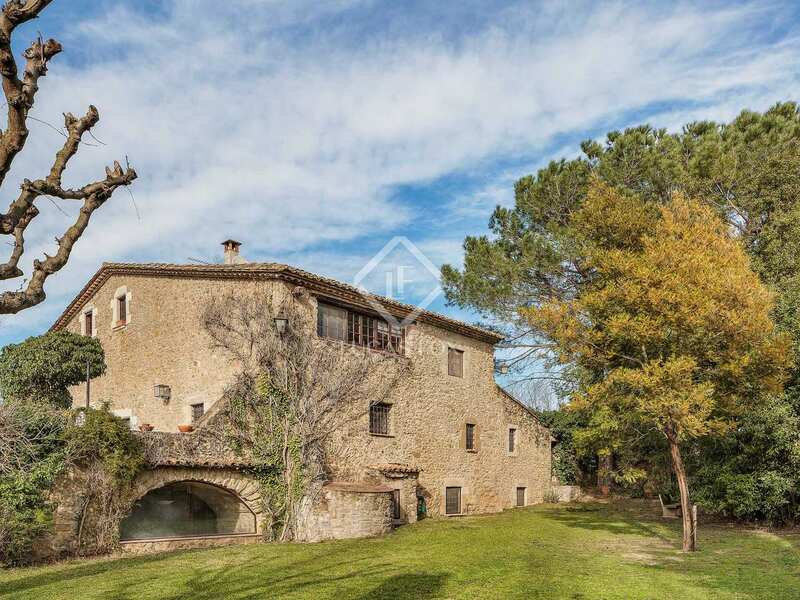 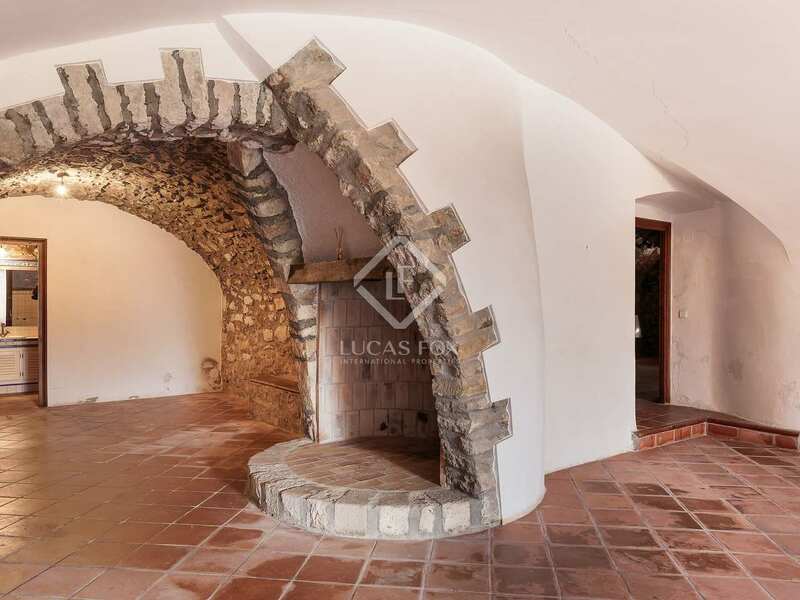 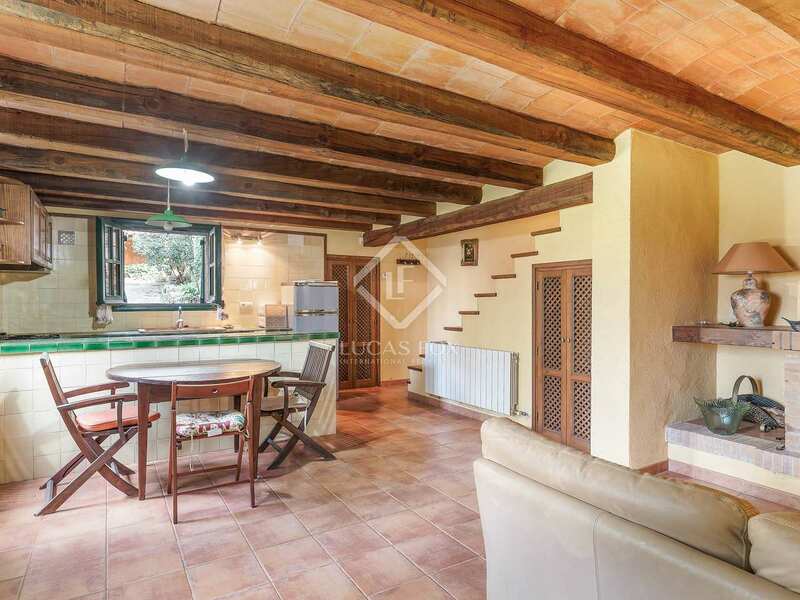 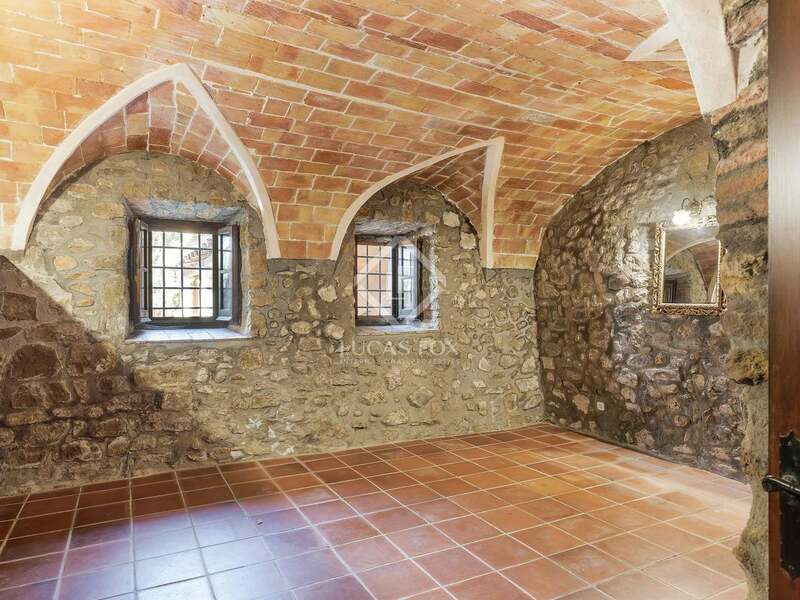 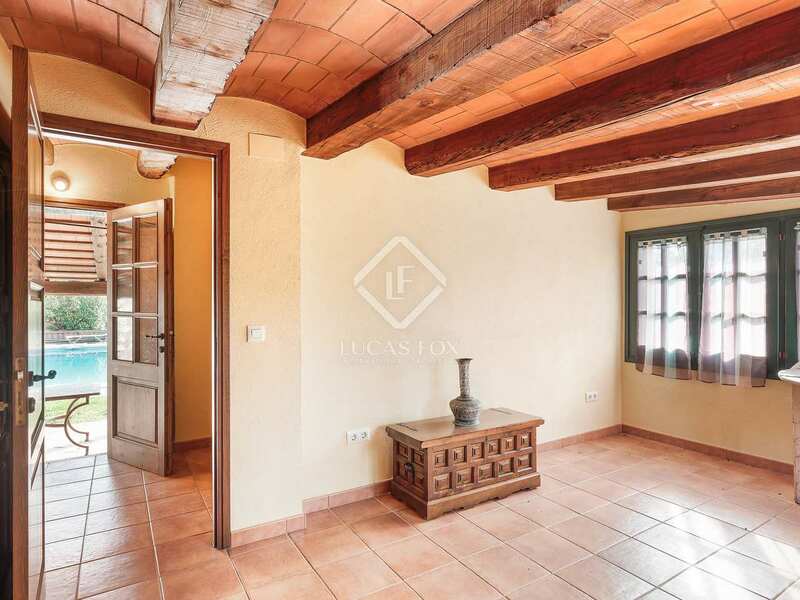 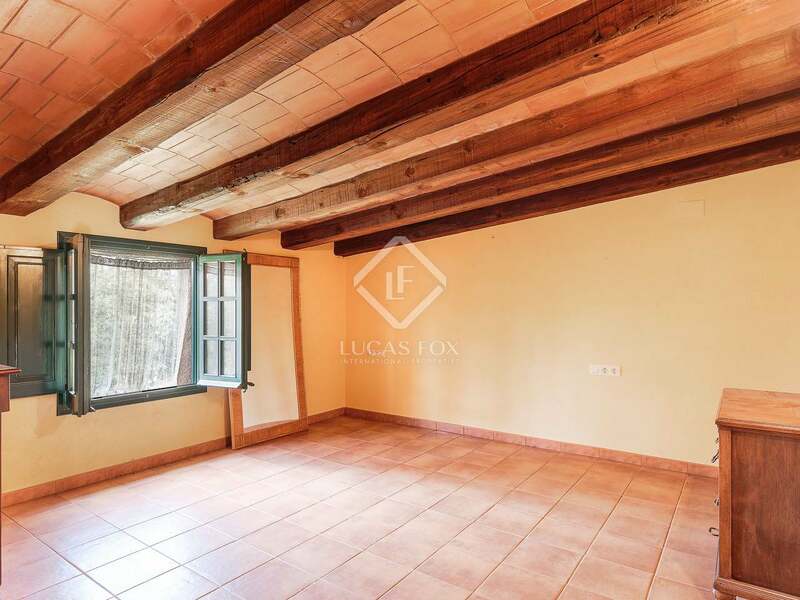 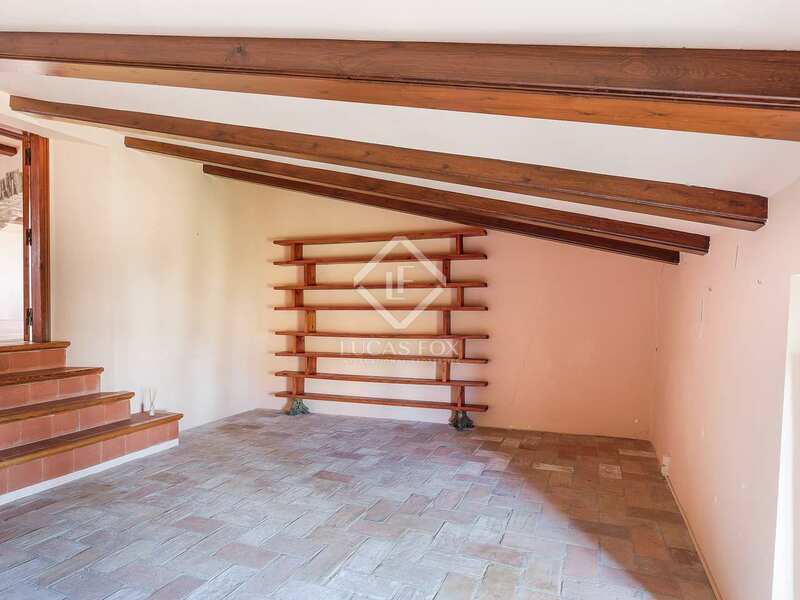 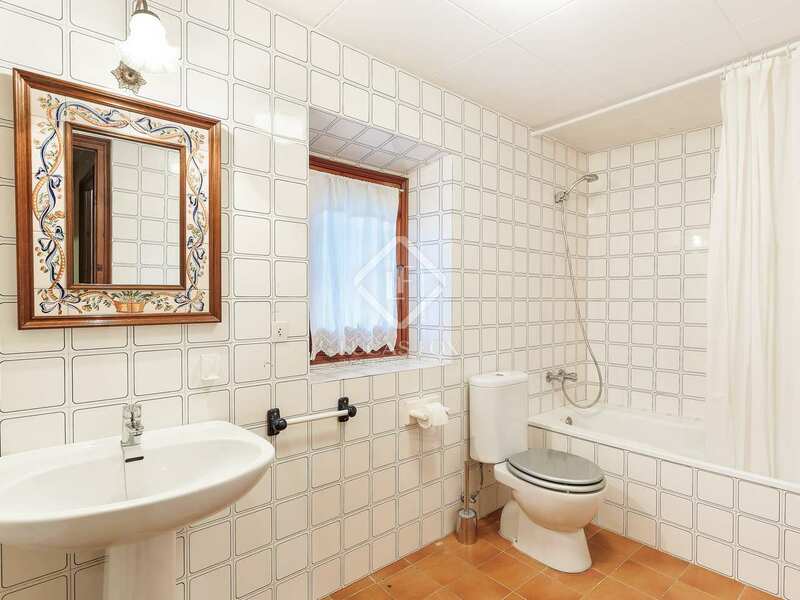 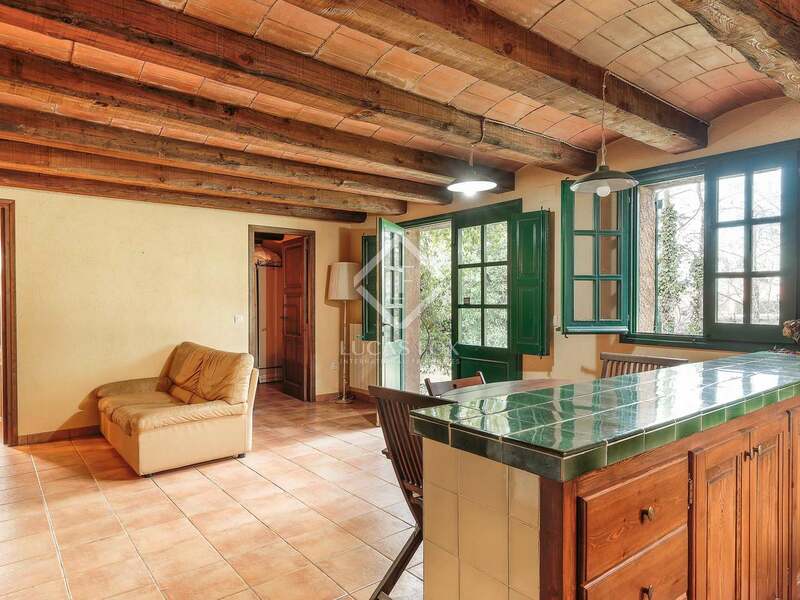 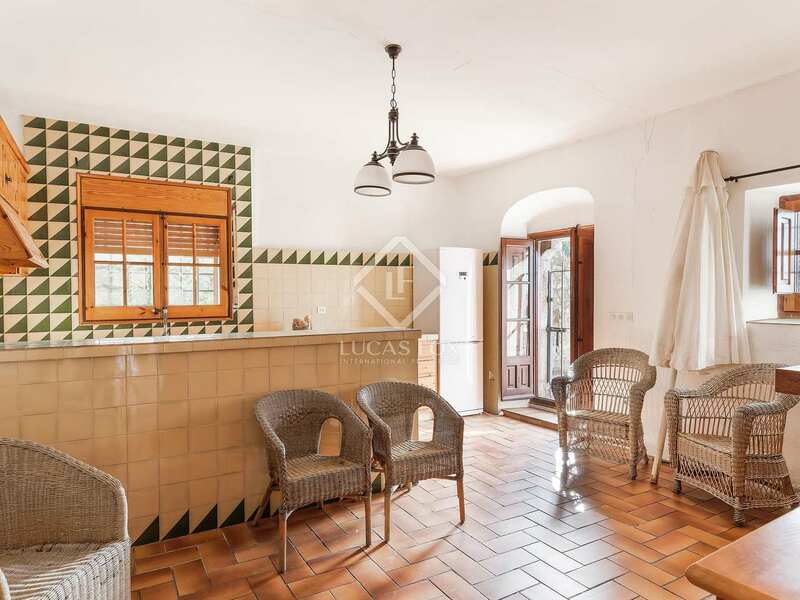 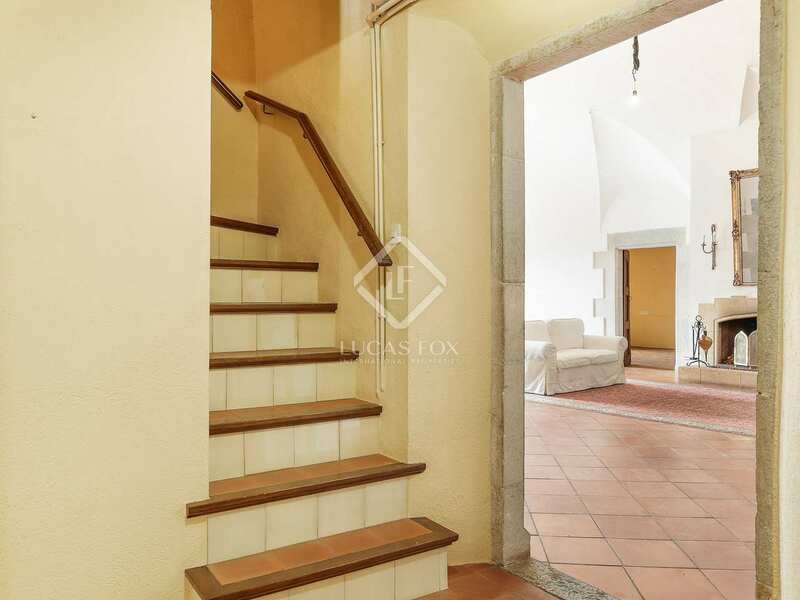 This property is located on the edge of a small village 20 km east of Girona and 25 km away from the coast. 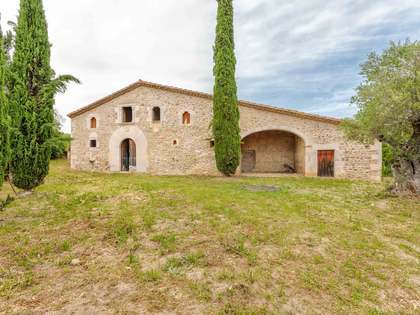 The village has shops and a train station and 5 km away there is a larger town with all amenities.